In layman's terms, obstruction colic is usually the result of a "twisted gut." Strangulation, also known as torsion, occurs when a piece of the intestine is twisted on itself. Intussusception occurs when a portion of the intestinal tract telescopes into an adjacent portion and is generally seen in foals, although it can occur rarely in older horses. Volvulus is the term used when a segment of intestine knots or twists on itself much the same as in torsion. Any of these conditions creates intense and continuous pain. Colic caused by an obstruction is usually the result of a malpositioning of a segment of the intestine although the obstruction may occur in the cecum or colon. The most frequent cases due to strangulation or torsion of the intestine are umbilical and scrotal hernias. These often occur in newborn foals and should be dealt with immediately to prevent strangulation of a portion of the intestine which may become trapped in the hernia. Occasionally, a stallion that has bred a mare will develop acute colic. A rectal examination will shows that a segment of intestine has passed through the inguinal ring and has become strangulated. Probably the most frequent cause of volvulus is indigestion, with the associated pain that causes the horse to move suddenly and roll violently. Intussusception occurs when a portion of the intestinal tract telescopes into an adjacent portion, causing pain and obstruction of that part of the intestinal tract. Since a horse's intestinal tract is not well anchored inside the abdomen, the large colon can float out of position and become twisted to an extent that its blood supply is cut off. Parts of the large and small intestine can become trapped in parts of the abdomen involving organs such as the kidneys and spleen. Although intestinal obstructions usually affect the small intestine, the obstruction may be in the cecum, colon, or the ileocecal valve. The obstruction in the ileocecal valve will usually be undigested fine fiber or grain, or sand accumulation. Often referred to as "intestinal accidents," the causes of obstructional colic, including displacements of parts of the intestine, torsions, and hernia in which sections of the intestine become trapped or pinched in the body cavity, always require emergency surgery. To reduce the risks of colic, horses should have regular access to pastures, both for grazing and for exercise. Horses with access to pastures are less likely to get colic than horses that are kept stabled more than 50% of the time. A systematic, regular approach to feeding high quality hay and giving water before feeding grain is important to keep the horse's digestive system moving smoothly. Never feed a horse moldy hay or grain. Make any changes in diet and exercise level slowly to allow the horse to adjust to the changes. The severity of the signs exhibited by the horse should not be ignored in cases of obstructional colic. When a horse shows violent behavior because of great pain, the veterinarian should be called immediately. A veterinarian will assess the horse's heart rate, temperature, gut sounds, and gums, and do further exams and tests including a rectal examination, passing a nasogastric tube down into the stomach to test for distension of the stomach, and collecting samples of peritoneal fluid and blood. If necessary, abdominal ultrasound and X-rays may be used for a complete diagnosis. Although most cases of colic can be treated in the field, if a horse needs surgery it becomes necessary to act quickly to prevent extensive damage to the horse's system or death. If the horse has an entrapment or volvulus, the blood supply to that part of the intestine may be cut off and will die quickly, releasing bacteria and toxins into the bloodstream that can kill the horse. Since horses can't vomit, feed and fluid that can't pass through the intestinal tract because of the obstruction will build up in the stomach. If the stomach ruptures, the horse will develop peritonitis, a deadly infection within the abdomen, and die. For these reasons, it is imperative to summon the best veterinarian possible when symptoms indicate colic because of an obstruction so that an adequate diagnosis can be made using the best tools available. 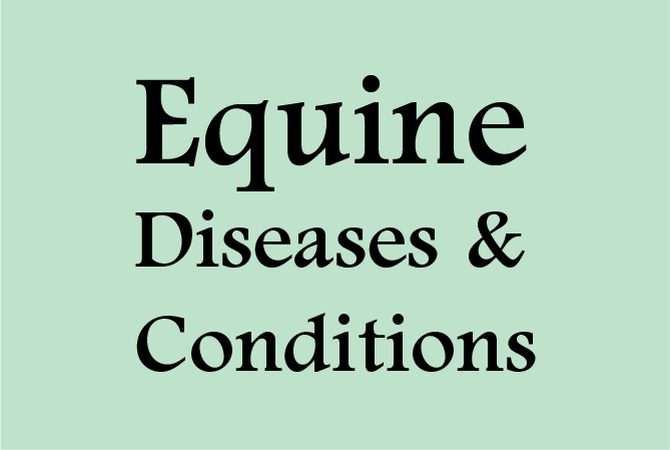 The veterinarian will be able to diagnose the cause of the colic and recommend either surgery or proper treatment depending on the horse's condition.